Foxwood, King An exceptional custom home built on 92 acres. First time ever offered. 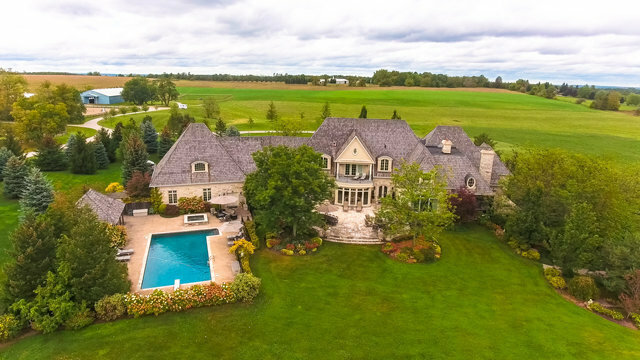 This elegant country home is perfectly positioned in the rolling hills of King within 5 minutes of Yonge Street, St. Andrew's College and The Country Day School. One of the best locations available! The home was built for the current owners on a high point of the 92 acre property on a site with distant views over the Town of Aurora and King. The long gated driveway is majestically lined with century-old maple trees. In addition to the main house, there is a well-maintained second home, plus a stable with arena and several useful outbuildings. The home was built by one of Toronto most well respected builders (Windemere Homes) with interiors created by a top interior design firm. The property enjoys extensive paved road frontage with mature trees and gardens plus open rolling lands. The large country kitchen looks south through massive floor-to-ceiling windows which flood the area with natural light. There is a breakfast area plus additional seating at the large centre island with its expansive granite counter. The kitchen opens directly onto the stone terrace and pool area which is wonderful for warm weather dining and entertaining. The kitchen has ample cabinet storage space in addition to a well-organized walk-in pantry. The panelled ceiling, large format stone floors, views, and the warm design colours make this kitchen a favorite space in the home.The barn has 17 stalls, bathroom, tack room, wash stall, laundry and an attached indoor riding arena. This stable complex could be leased out to an area horse professional to produce income, if desired. Alternately, the stable can be used for an owner's own horses or used for other recreational/hobby purposes. Ample paddocks and hayfields surround the stable. There are two large outbuildings between the second house and the stable which offer ample storage/workshop space.